Jim slowly started noticing a slight bow happening and over the years its become very apparent. Jim was concerned of it collapsing and wondering is there we a way to straighten out the wall without having to redo the foundation. Our Design Specialist, Dan Garner recommended our PowerBrace System. The PowerBrace is designed to support basement walls and allow for potential straightening over time. New radon mitigation system installed in Ottawa, IL. Home Free of Radon Gas in Ottawa, IL. Home built in 1928. Crack in exterior cement blocks. Has a crawl space. Waterproofing for seeping unfinished basement. Just did a 48 reading at 7.9. I have a north basement wall that in the past year started when it rains heavy, a few cracks will leak. If you come to our area, my neighbor may also request that you look at her problem too. I am looking for an estimate for insulating a crawl space. Courteous, enthusiastic and timely response to my call for service. Prompt scheduling. The office staff kept us informed on when they would start and finish. They were very helpful. They were always positive and encouraging. They displayed an incredible work ethic! Ryan was outgoing, friendly, courteous and knowledgeable of basement waterproofing. They were very professional and sent information about the product. Carlos and Alec were very courteous and efficient. I am very satisfied with the job at this point. I am looking forward to the spring rains this year. "The installation crew was courteous, talkative and fast..."
"Dillon and Doug faced extremely challenging conditions and..."
We will properly install a hidden drainage system in your Ottawa basement and completely encapsulate your crawl space with CleanSpace vapor barrier. We are here to solve the problem for you. Unlike the average Ottawa contractor we use completely inorganic, waterproof materials. Even if the basement floods your walls and floors will not be damaged by the water. These waterproof products are patented and are built to create an attractive finished basement that lasts a lifetime. Foundation problems such as bowing foundation walls destroy your Ottawa home’s value and can be dangerous. Our in-house team of structural and geo-technical engineers are here to help. We design and install the right solution and usually have the project finished in less than a week. You will have peace of mind as we provide a 25-year written warranty against defects on our foundation products. The sunken, cracked concrete around your Ottawa home is both an eyesore and a safety hazard. It is also likely to get worse, but we can fix it for you. If you think you might have radon gas seeping into your home, it's time to take action. 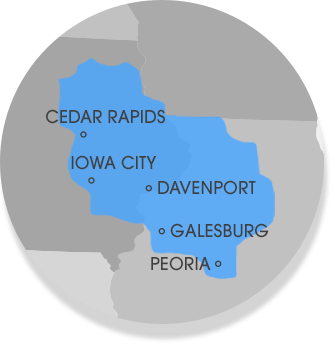 We help homeowners in Ottawa, IL with radon testing, and can even provide a FREE quote for the cost of a radon mitigation system for your home. SuperSump is a patented sump pump system that will keep water out of the basement and also alert the homeowners of there are any potential floods within the basement! CleanSpace liner is a wonderful system that wards off mold growth, creates a water vapor barrier and drain wall leaks all the while adding a brighter, cleaner touch to the basement. The radon mitigation systems come in white however this homeowner decide that they wanted the system to blend in with their home so they painted it. Homeowner Timothy has lived in his home for many years. Over the last few years, he has been concerned with the condition of his basement. He decided it was time to call the professionals at MidAmerica Basement Systems. After a full inspection of the inside and outside of his home he decided o have a full perimeter waterproofing system installed. The WaterGuard system is installed around all of the exterior walls where the water that is entering the home will be moved to the sump pump. The new TripleSafe sump pump is a three-pump system that will make sure the home stays dry. The TripleSafe sump pump also comes equipped with a battery backup system that will keep the pump running in case of power loss at your home. After the system is complete Timothy will never have to worry about water in his basement again. Homeowner Karl recently contacted MidAmerica Basement Systems to learn more about the crawlspace under his home. The Design Specialist educated him on why it was best for the quality of the home to be encapsulated. He was very interested in the process of encapsulation because it addressed his worries about the moisture causing mold and other harmful health issues. Homeowner Kevin recently contacted MidAmerica Basement Systems to learn more about basement waterproofing. They were concerned that the water was causing damage or growing mold due to moisture. They wanted the basement to be a place that they could use as storage. After meeting with a design specialist they decided to have the basement waterproofed. The WaterGuard system moves the water to the new sump pump, the TripleSafe sump pump will then pump the water out of the home. Homeowner Kevin has lived in his home for many years and recently decided that it was time to have his basement looked at professionally. He wanted to have the basement waterproofed after experiencing water issues in his basement. He decided that it was best to have a full waterproofing system installed in his home. The waterproofing would make sure that the basement was free from water and damage. New Ground WaterGuard System in Ottawa, IL. Homeowner Tom has lived in his home for several years. After a large amount of rain experienced recently, they decided that it was best for them to have a waterproofing system installed in their home. A full perimeter WaterGuard system is added to the home. First, a trench is dug around all of the exterior walls where the waterguard will be placed. The WaterGuard is like channeling system that moves water to the sump pump. This homeowner noticed that her basement was starting to take on water. She wanted to have the basement waterproofed, however she did not know where to begin. She called MidAmerica Basement Systems and arranged an appointment for a free quote. After a full inspection of the interior and exterior of her home, she decided that the best course of action was to have a full waterproofing system installed in her home. Based on our recommendation, she went with the full perimeter WaterGuard system, the TripleSafe sump pump, and CleanSpace walls to ensure that her home stays dry goind forward. Homeowner Bill has lived in his home his entire life. The home has been in his family for over 100 years. Over many years they have noticed that the water in their basement was getting worse and he wanted to make sure that his home would be protected for the next 100 years. He had a full perimeter waterproofing system installed into his home. The WaterGuard System is installed around the perimeter of the home. The WaterGuard System is like a channeling system it moves the water through the system to the sump pump. Homeowners of this Ottawa residence, wanted to be done dealing with their leaky basement so the MidAmerica Basement Systems experts were contacted. The team waterproofed the basement by installing a WaterGuard perimeter drainage system, CleanSpace liner and a TripleSafe sump pump. The homeowners are relieved to have a dry basement! Water leaks into south east corner of basement when there is a heavy rain or accumulated snow. Like many others in the area we have about a inch of water in our basement. Tired of cleaning up the mess and would like to have a dry basement. Would like to see if we could make that happen. Looking to purchase a home. It has everything we like, but the basement walls have significant bowing. Looks like a perfect candidate for foundation wall anchors. Simple rectangular basement ~28x52'. Both long walls are in need of correction. Before I go through with the sale, I would like to get an estimate to correct the basement walls. And I would like to know if the house is generally structurally sound. All floors are flat and level, not creaking, or sinking. It feels really solid on the living floors, but the basement has a lot of water seepage due to the significant bowing walls. The house is not occupied, is for sale, and has our offer pending on it. The seller said he is selling the house "as is" - and after the inspection, I am a little scared now. I just want to know what the repair cost will be before we finalize the sale. Thank you. Please email me - I have very poor cell reception where I work. Sidewalk and concrete steps sinking.